Not to mention you can get away with 31s and 3.73 gears. If you got up to 33s, you'll want to regear. I've been running 33s on 3.73 since July and I'm ready to get my power (and mpg) back. I am very glad you are asking these questions and looking for pictures. Build it once, build it right and use quality parts. If you will never go higher than 33s, than a 2" lift is fine. Last thing you want to do is replace the parts you just replaced because you were indecisive. 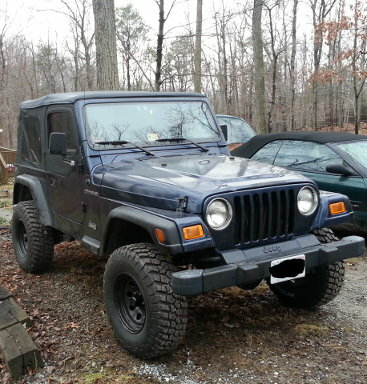 Personally I do not think 31s look bad on a TJ with a small lift. But I guarantee, if you start offroading you will want to upgrade to 33s as it makes a significant difference. Other than regearing which is optional, not much else will need to change. I personally think that the sweet spot for TJs is running 33s, as it is still a really capable rig. Short wheelbase, not too high for daily driving, and well balanced. With the 2" OME lift and a 1.25' body lift to accommodate a tummy tuck, on 33s, I can run blues/blacks at Rousch all day long and keep up with the JKs on 35s. The 4:1 transfer case helps a lot (a whole lot), but I still think I could hang with a 2:1. No matter what anyone tells you, at the end of the day, the biggest determining factor of what trails you can run successfully and safely is in the driver's seat, not any part, lift or wheel size. The bottom line is I currently am running stock suspension. I also currently run 31s. I had to buy new tires back in September with no intention of lifting the Jeep. Lately, things have changed and I could put a lift on right now. I always intended on putting either a 2 or 3 inch lift. So I started thinking, which we all know can be dangerous, and thought I could go ahead and put a 2 inch lift on now and run 31s until I need new tires and go up to 32s or 33s. So I was trying to determine if it would look goofy or not. I know if I went with the 3 inch it would look really strange. Like you said above, I am looking into doing all the research because I want to make a good decision in the end so I don't regret it and have to go back later. Any additional input anyone has is greatly appreciated. I know a lot of tj lifts (mine included) will do a 2 inch suspension lift, coupled with a 1 inch body lift. If you were to order a kit like that now, install the suspension and run the 31s until you're ready to upgrade tires, then install the body lift you would be in a great place. That looks pretty good. Which kit do you have. How do you like it. Do you wish you had igger tires. It gets the job done. It's the Old Man Emu 2.5" kit for the TJ. I put it in in a saturday afternoon. At the time I wondered if I should have gone larger, but with only the 2.5 it was kinda a no brainer to leave it be. 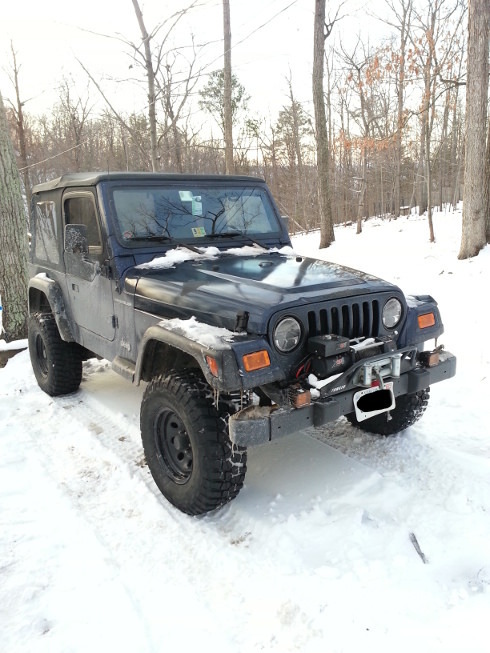 I've since acquired another 97 TJ with the I6 and running a 6" with 35's on it now. Still run both jeeps. The OME and 31's ran fine and frankly the extra clearance in the wells from not over-stuffing too big a tire is good. Leaves you more room for maneuvering. Still gets around, but it's only a part-time/every once in a blue moon wheeler so take that for what it is. There was a significant drop in "oomph" with the increase in tire size plus that one has the 2.5 in it, but that was mostly fixed with re-gearing in the diffs. I actually have BFG TA/KO2's in 32" on it now. Fast forward a few years and I'll prob be saying the same thing about a 3rd and 4th jeep. Do you have any pics directly from either side with the 2 inch lift and 31s? Alright guys, I'm still doing some research into this so hopefully I'm not asking too many questions. Does anyone have the OME 2 inch lift? If so which shocks do you run? Also, I was thinking about possibly going with the OME springs but running an adjustable shock. Does anyone have any experience with adjustable shocks or know if that would be a good setup? Basically, I think whatever setup I go with, I want to run an adjustable shock. I know it will be more money. Is it worth it? I have the OME 2 inch lift with their shocks. It's awesome. Call Dirk at dpg offroad, he knows his stuff and will help you out. I too have the OME springs and shocks. Definitely more expensive, but I do not regret spending the extra money one bit. Ride, dampening, stability all much better than stock. I have beat the tar out of it for several years, and still rides well. Without reservation I would recommend this set up. Thanks for all the input. This is really helpful. I have a few more questions. First, other than the obvious, is there any difference between running a 3 inch suspension lift vs a 2 inch suspension lift with a 1.25 body lift? Performace on/off road, handling, etc, etc.???? Second, for those running the OME setup, how much lift did you actual get from it? Also, what would you think of running a different shock with them like and adjustable Fox shock or something? Last, other than the OME I was considering the JKS setup. Anyone running that on a TJ? I'm sure I will have a lot more questions. I am only in the prelim stages of thinking about this. I want to build it right the first time. Bump. Anyone have any insight?